Do Guinea Pigs Rely on Sight? Rodents are prey animals, which means that to an extent, they do need to rely on their eyesight. That doesn't mean they have great eyesight, but it does serve a purpose. The poor eyesight of guinea pigs can be dangerous in captivity, but you can use the knowledge of your pet's eyesight to keep him safe. Understanding your pet's eyesight is also essential for socializing your pet. A guinea pig's eyes are located on the sides of his face to allow for 340 degree views. This is because guinea pigs are prey animals who need to watch out for danger. 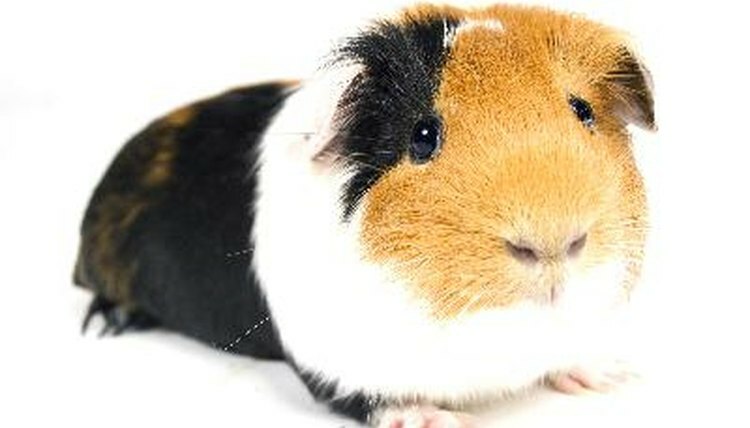 Guinea pigs have yet another advantage -- they can see 33 images per second. Compared to human vision, which is 22 images per second, this feature prevents blurred vision when a guinea pig turns his head. Guinea pigs can also see color, which allows them to differentiate from red, green and blue. While a guinea pig does have the ability to use his eyesight for protection, he lacks depth perception. In captivity, a careless owner may place her guinea pig on the counter and the guinea pig may fall off because he can't judge how far away the ground is. This can lead to broken limbs, concussions and even death. Guinea pigs who are kept as pets can easily become injured because of their poor eyesight. As a responsible owner, avoid cages that have ledges that your guinea pig could fall from. You should also be mindful of your guinea pig when he's playing in an exercise ball. If not careful, guinea pigs can crash into walls because of their poor eyesight or may even go careening down the stairs. Make the area safe before allowing your guinea pig to play. Never place your guinea pig on a table or counter and leave him unattended. For safety reasons, always play with your guinea pig in a seated position, preferably on the floor. Always lock the cage to prevent escape. If your guinea pig's cage is housed on a stand or table, your pet may fall to his death after escaping. Your guinea pig doesn't see well, but he does rely on sound and his sense of smell. When your guinea pig hears something, he perks up and listens for what made the sound. He also uses his sense of smell to find food and recognize you. In the wild, the guinea pig would listen for predators and also search out food through scent. What Does the Boa Constrictor Look Like? How Do Sharks Catch Prey?